Most indoor sows farrow in crates, originally designed to reduce the risk of sows crushing their piglets by limiting sow movement, particularly as they lie down. Farrowing crates limit the most basic of behaviours in the sow; they are unable to turn around, walk, nest build or form a good maternal bond with their young. In addition, there is an increased risk of piglets being born dead or savaged by their mothers (especially for first-time mothers), and piglet behaviour is severely restricted due to the barren environment. Despite many years of research into alternative farrowing systems, clear recommendations for commercially viable alternatives have been limited, until recently. Practical alternatives to the farrowing crate are now in the final stages of development, and some are already in use on commercial farms. The most comprehensive overview of the current situation is produced by Scotland’s Rural College (SRUC) and Newcastle University, and can be found online. In general, there are three indoor alternative farrowing systems to the crate: individual farrowing pens, individual temporary crates, or group systems. Here we focus on individual pen and temporary crating systems. Both provide commercially viable options in terms of production parameters and operator safety, and represent best and better options for sow and piglet welfare potential. 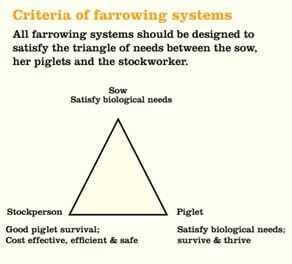 Each system is evaluated according to how well the design features meet the needs of the sow and piglets. Until recently, space requirements of sows and piglets were not investigated in a systematic way. Use of the allometric approach has resulted in more detailed information. For the sow... A pen of 9.75m2 will provide space for a nest area, separate feed area, space for growing piglets and a creep. In practice, pens of 7-7.7m2 are being used successfully. A sow of 350kg needs 2.44m2 to stand and feed, which can be incorporated into an overall space requirement of 3.17m2 to get up, lie down, give birth, suckle and turn comfortably. For the piglets... A litter of 14 piglets requires a creep area of approximately 1m2 at 4 weeks of age, if all piglets lie in the creep at the same time. Pen design is a crucial determinant for sow and piglet welfare. For more detailed information on this, click here. 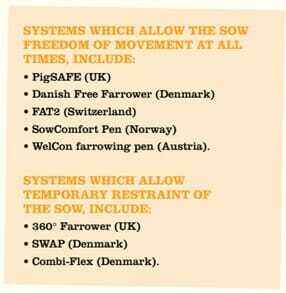 For the sow... Sows have a behavioural need to nest build, and prefer enclosed areas in which to farrow. It is important that the nest area has 2-3 solid walls (minimum 1m height), to provide an attractive enclosure; sloping walls to support the sow as she lies down smoothly; and must allow piglets to escape being trapped, perform teat seeking behaviour safely, and even improve udder access. Ability to lock-in piglets for management observation when needed, and ability to provide supplementary solid feed and/or supplementary milk if necessary. Corner or side creeps are recommended, as they are closer to the udder, and all creeps should be accessible from the passageway for ease of use. separate sows and piglets for management tasks. Lying areas for the sow and piglets should provide thermal and physical comfort, while dunging areas should be separate and easily cleaned to reduce the risk of disease and contamination of the lying areas. Provide a minimum of 2kg of long straw for the sow to adequately perform her nest building. From 24 hours post-partum, this can be reduced to small quantities of chopped straw or sawdust for bedding material. Solid flooring with drainage slots is preferable for the nest area, with a 2% slope away from the nest/creep. During and shortly after birth, straw in the nesting area should provide a depth of around 10-12 cm to encourage piglets to dry off and warm up. Outside the nest area, slatted flooring with a void space of 10mm or less should be provided. Provide foraging material such as chopped straw, wood shavings or peat for recreation, which may also help to discourage behaviours such as belly-nosing. Materials used for nesting, bedding and occupation should be complex, changeable, hygienic, relatively destructible, safe, manipulable (to encourage chewing, rooting and exploration), edible (non-toxic, with a gut fill or nutrition value), practical, and should be locally available and satisfy the needs of the sow and piglets. • make the floor non-slip, non-abrasive, and hygienic; have good drainage and preferably a flushing slurry system if straw is used with slats. Sows and their litters have very differing thermal requirements. Temperature in farrowing houses should not exceed 18-23 degrees C, as heat stress in the sow can lead to reduced feed intake and lower milk output. Providing bedding however, allows sows to create a warmer micro-climate for her piglets, and encourages her to make fewer postural changes. As lactation continues, consideration should be given to cooling the sow in order to maintain feed intake and milk output. Floor cooling systems can increase nursing time, feed intake and piglet weight gain, and evaporative cooling is recommended in hot climates. For the piglets... Newly-born piglets are wet, cannot thermoregulate and have no active immunity. They need to dry off, warm up and ingest colostrum as soon as possible. New born piglets require temperatures of 34-35 degrees C, but by 3-4 weeks of age they can thermoregulate more effectively. Access to long straw in the nest at birth, and access to a heated creep until weaning, should ensure that piglets do not become chilled. If piglets are observed huddling, then the creep is too cold; if they are lying outside the creep, then it is too hot. Systems which are designed to fulfil all the needs of the sow and her litter will be more acceptable from a welfare point of view, but require more space and are more expensive to build and maintain. restraint of the sow should not become permanent. It may result in a system which is easier to manage, but would not offer an improvement in sow welfare compared to the traditional farrowing crate. It is clear that a number of projects in several countries have now addressed the design of farrowing accommodation using basic behavioural needs as the starting point of the design process. As these are tested and modified on farm, there is a real possibility of several practical alternatives to the farrowing crate being commercially viable in the near future. 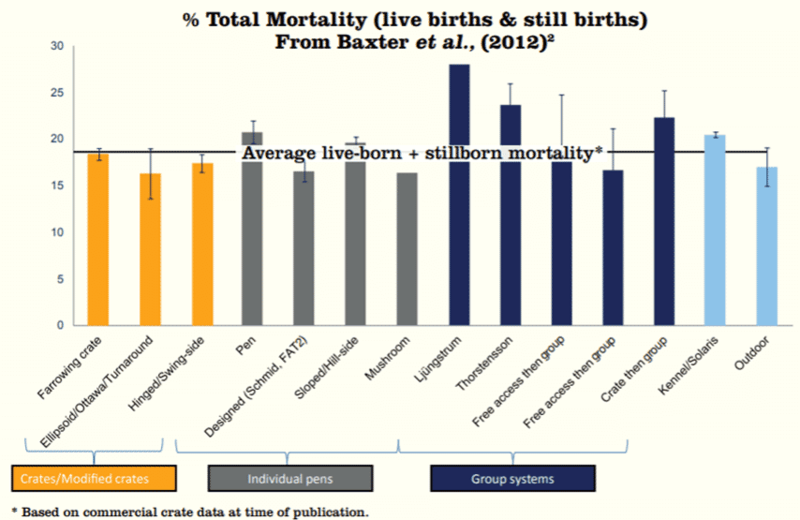 Recent data comparing mortality of different systems indicates individual free-farrowing systems can operate at similar levels to the farrowing crate. Comparison of farrowing housing options: Crates/ modified crates (yellow); individual pens (grey); group systems (navy blue); outdoor systems (sky blue). Select for high survival lines, particularly from sows that take care when lying, and are calm in the post farrowing period and relaxed towards the stockperson. Mortality may be high when new system first installed, but good training and a positive attitude will reduce mortality. A market premium, estimated average 1.6% required for PigSAFE. Click here to access more free-farrowing content from Compassion in World Farming. www.freefarrowing.org produced by Scotland’s Rural College and Newcastle University. Compassion has then evaluated a number of individual systems based on this information. Our kind thanks to Dr Emma Baxter and Professor Sandra Edwards. 1. Baxter, M.R. and Schwaller, C.E., 1983. Space requirement for sows in confinement. In Baxter, S.H., Baxter, M.R. and MacCormack, J.A.D. (eds.). Farm animal housing and welfare. Martinus Nijhoff Publisher, the Hague, the Netherlands, pp. 1481-1495. 2. Baxter, E. M., A. B. Lawrence, and S. A. Edwards. “Alternative farrowing accommodation: welfare and economic aspects of existing farrowing and lactation systems for pigs.” Animal, 6.01 (2012):96-117.